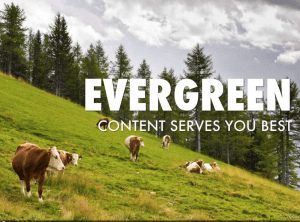 Perennial content takes years to establish, but pays off year after year. Take a step back to set a deliberate strategy. Learn from last year’s results, and focus on the harvest ahead. Although there’s still snow on the ground, the long winter in Chicago is almost over. We’re already hearing the songs of migratory songbirds. The gardeners among us have spent time during the winter to prepare for our next harvest. Similarly, successful content marketers need to take time each year to set strategy for the year ahead. Here’s a template to help you set your content marketing strategy. What can content marketers learn from gardeners’ winter preparations? 1. Analyze what worked and what didn’t last season. How was your harvest? Last year, squash was so bountiful that we’re still eating it. But our tomatoes have been awful for years – this year we won’t even bother. Which content will you create more of this year? Is it time to abandon certain topics? Which calls to action are working best? Your analytics will show you the most successful 10% to 20% of your content. Invest your time into creating more of the content that’s working well already. 2. Address structural needs. In winter, with the leaves down, it’s easy to see the structure of a tree or bush. Fruit trees are trimmed in winter, when their bare branches enable you to see them well enough to shape them. Take time to examine the structure of your content. Are there topics that are overgrown, that need to be trimmed? Is there content you can remove to let more light in, making other content more visible and productive? 3. Plan for the year ahead, starting with long-lived stock. Landscape plans start with spots that are big enough for trees and shrubs. This year we will add peach trees to our orchard, and fit in smaller plants around them later. 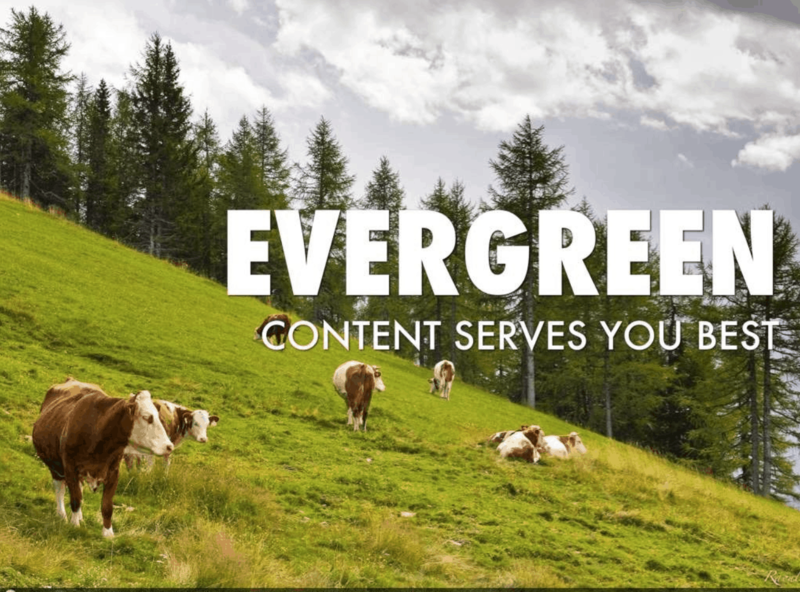 Which major content could you create that could take root and flourish for years? Which topics consistently come up in your customers’ buying journey? Make sure you offer content that always looks good. 4. Keep content fresh year-round. Many gardeners include evergreens in the landscape, so that part of the yard stays fresh and green year-round. Chicago gardeners can even manage to get flowers during the winter by planting witch hazel, which blooms on warmer winter days. Which content looks great for your business, no matter the season? Which content might blossom when it’s least expected? 5. Have the patience for perennials. Perennials demand extreme patience because they take years to get established. But once established, they reward you with harvests year after year. 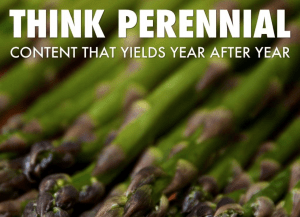 Perennial content marketing yields a harvest year after year. 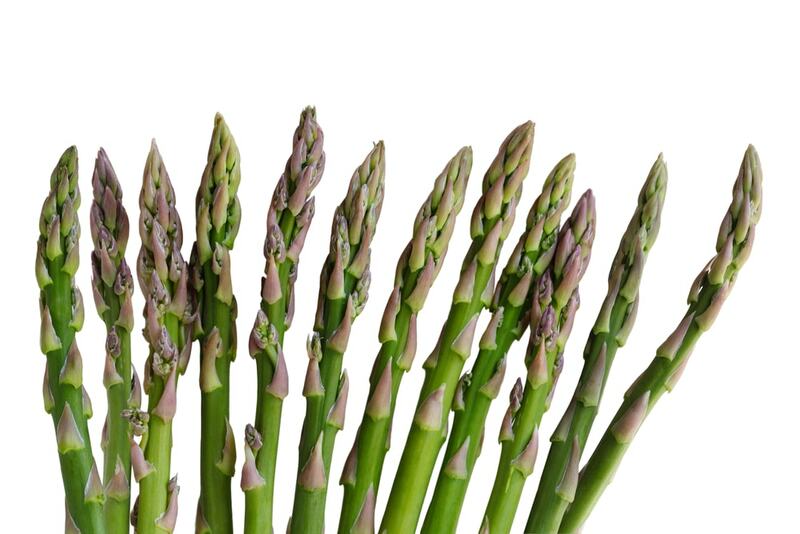 My favorite vegetable, asparagus, takes two whole years to establish, so you get zero harvest in years 1 and 2. 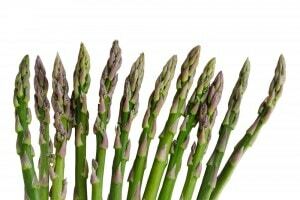 Starting in year 3 for the next 20 years, you get two crops of asparagus a year – with little added effort. Nothing’s better than asparagus picked from the garden, then grilled on the barbeque minutes later. Freshness counts in gardening and marketing. Which content is perennial in your strategy? What might take months or years to get established, but could pay off year after year with little added effort? 6. Choose annuals – and experiment! Annuals are the day-to-day content of gardens. Experiment each year with new things you’ve never tried before. Last year, my experiment with edamame (edible soybeans) was wildly successful. This year I’ll try edamame again at an even bigger scale. And I learned something last year: I need to record the exact planting date of edamame so I can harvest precisely at the peak. What worked well in last year’s content marketing that you could scale up this year? What did you learn that you can build on? 7. All plans lead to harvest. Based on our garden plans, we expect to harvest vegetables and fruits from April through November. We stretch out the harvest by covering our container plants in the fall – so we can harvest lettuce, chard and kale all the way to Thanksgiving. What did you learn last year that could lead to better results? What plans could lead you to an even bigger harvest? In the end, content marketing is all about converting content and conversations into customers and revenue. Are you prepared to nurture leads, qualify them and hand them off smoothly to sales? Is it time to bolster your company’s demand generation process? Do you find lessons about content marketing in other fields? I’d love to hear about your experiences – write me at george@crystalclearcomms.com.